I swear, had I not already known beforehand that Michael Mann, that's right, the same guy who gave us Manhunter, Heat and Collateral-the same guy known for hard edged and violent thrillers more than anything- had done this, I never in million years would have guessed that simply by watching this film. Truth is, I haven't seen everything the guy's ever done, but simply judging by the films he's most famous for, this is like nothing he's ever done before. During the second World War, a group of Nazis, led by Captain Klaus Woermann (Jurgen Prochnow), are ordered to seize an old, stone fortress located at the end of a Romanian pass. Once they have taken control of the fortress, one of the idiot soldiers, who greedily tries prying off a silver cross implanted deep into the stone wall, releases an evil supernatural force and the soldiers start dying off one by one in exceedingly gory fashion. When reinforcements are called in, led by the maniacal Major Kaempffer (Gabriel Byrne), it soon becomes apparent that there is a force at work here far out of there control and means to stop. Soon after, the Nazis are made aware of a Jewish scholar and his daughter, who have intimate knowledge of the Keep and it's secrets, and are brought in to help in an effort to stop whatever is happening. At the same time, a mysterious figure from faraway Greece (Scott Glenn) becomes aware of the evil force's release and begins his journey to Romania to stop the evil from ever escaping. I enjoyed this one a lot more than I should have. It has it's fair share of problems, like massive plot holes, a laughable "man in suit" kinda villain and a "lot" of things that are never explained, but what it lacks in structure it makes up for in creative visual film-making, outstanding special and makeup effects and a brilliant opening act. I think what most people will take away from this when it's all over, apart from it's odd casting choices and completely out of place score by none other than Tangerine Dream (with a lot of it sounding like it came right outta Blade Runner), is the fact that while it opens with a strong atmospheric and brooding first act, it retains near visual brilliance even when the film unfortunately falls into silly and ridiculous territory towards the end. As I said before, this thing starts off brilliantly with genuine dread and some pretty spectacular visual camerawork, special practical effects and badass kills. But somewhere about the halfway mark it turns into more of a monster movie complete with "man in suit" silliness and overstays it's welcome. Which is a damn shame because if you take out the kinda lame looking villain revealed towards the last act, it retained a pretty creepy and atmospheric dread. But that's all ruined once the "man in suit" villain shows up. Scott Glenn, who plays the hero/stranger in the flick, is completely miscast here. I don't know, he's not bad in it or anything, but he has so much more to offer as an actor and here he just seems wasted as the weird looking silent guy with strange eyes. 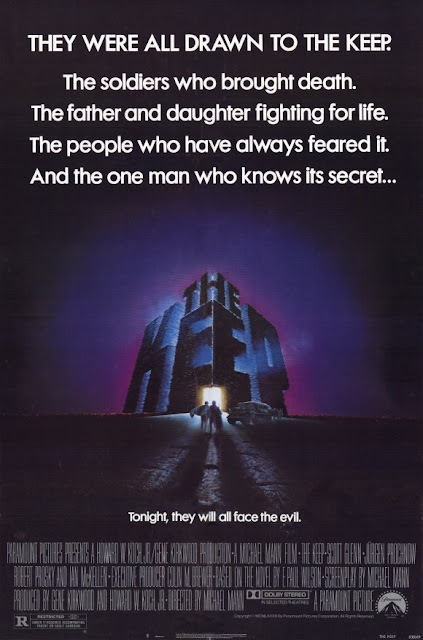 You know absolutely nothing about him or why he's drawn to the Keep once the evil is accidentally released and it's never explained. He just "feels" the evil being released and travels to Romania with his special weapon to stop it and that's pretty much all we know. The rest of the cast is pretty great though. Jurgen Prochnow and Gabriel Byrne are great as the Nazi leaders assigned to take over the Keep, but we also have the great Ian McKellen as the Jewish scholar brought in to help figure out what is happening in this mysterious place. As much as I love McKellen as an actor and how great he is in a lot of roles, here something is just off. I don't know if his weird accent was on purpose or not, but sometimes it sounded like he came right outta California, and then sometimes it sounded like he wasn't sure what kind of accent he was supposed to be channeling. Most of the time, it was too much of a distraction whenever he was on screen. You just wanna yell "Pick an accent and stick with it!". Tangerine Dream was another unusual choice for the score. Though I'm not sure I'd call it a misstep as more of an odd choice in choosing a composer to do the score for a film of this kind. Almost angelic at times, and sounding a lot like the Blade Runner score by Vangelis, it seems a little strange at first when you're used to hearing loud and thunderous themes to films like this. But once the confusion wears off, it gives the film a more "dated" sound, if that makes sense. Like, when you hear it, you know almost immediately it's from the early 80's, there's just no getting around that. And that was a good thing......for me anyway. After about 30 minutes I was sorta digging the feel that score gave the film, almost like you might be watching a fantasy, but a much darker one. One things for sure, they sure don't score films like that anymore, and I wish they would. 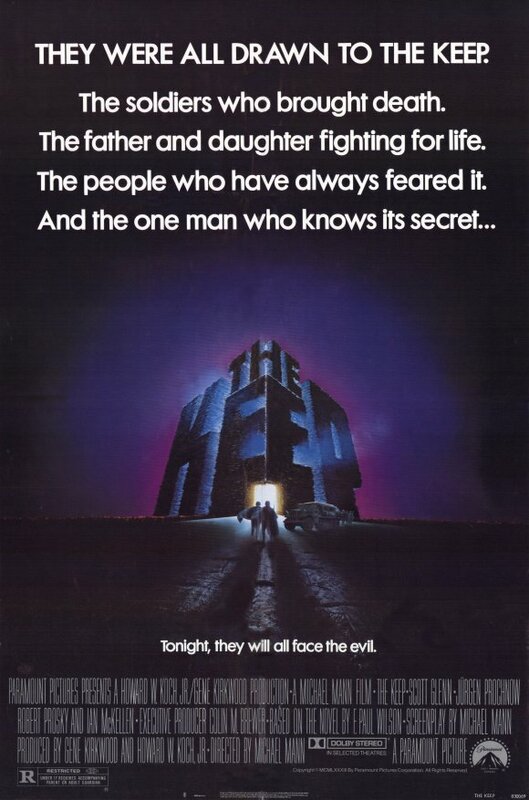 Problems aside, The Keep was a badass horror thriller. Some of the kills in here were just plain awesome and Mann shockingly delivers near brilliant visuals and camerawork. It's important to note that while the second half of the film delves into silly territory and you're left with a shitload of unanswered questions, the first half is worth the price of admission alone. If the second half had delivered on the brilliance of the first half, writer/director Michael Mann woulda had a bonafide horror classic on his hands. I've had to just skim this review because I literally order a copy of The Keep a few weeks ago and have yet to get around to watching it. I'm actually trying to finish reading F Paul Wilson's book first - it's a good read if you like the story. Always wanted to see this rG but never been able to find a copy, great review. Hey, now I'm curious. I never actually bothered to check to see how easy it was to get a hold of or if it was even released on DVD. I was lucky enough to catch it on Netflix Instant by chance and it sounded interesting. Minus the few gripes I had with it, it was pretty awesome. Thanks for the support man! 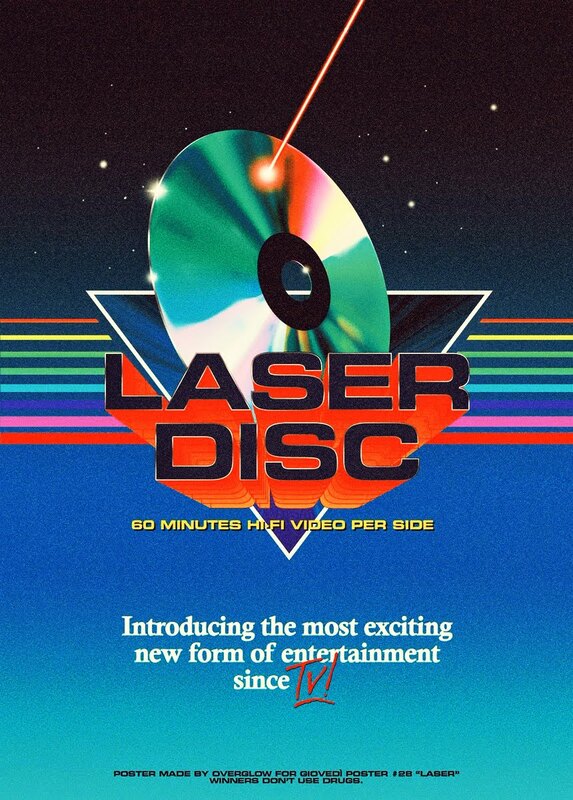 Seems to be rather rare and expensive(the VHS), and an official DVD does not exist..the only widescreen version is the Laserdisc, and someone sells copies of that on ioffer.com. Thought this was a solid horror flick. Happy you enjoyed it too.